Pizza has become an abused and over-used culinary attraction these days. So when I saw one of my former favorite restaurants completely re-transformed, it definitely sparked my interest. And yes, I said re-transformed, because it was first a Polynesian restaurant from the last few days of that Tiki actually made it into the 1980s. Later it was a Spaniard restaurant and quite frankly, the food was so inconsistent I am very surprised it lasted more than 10 years. 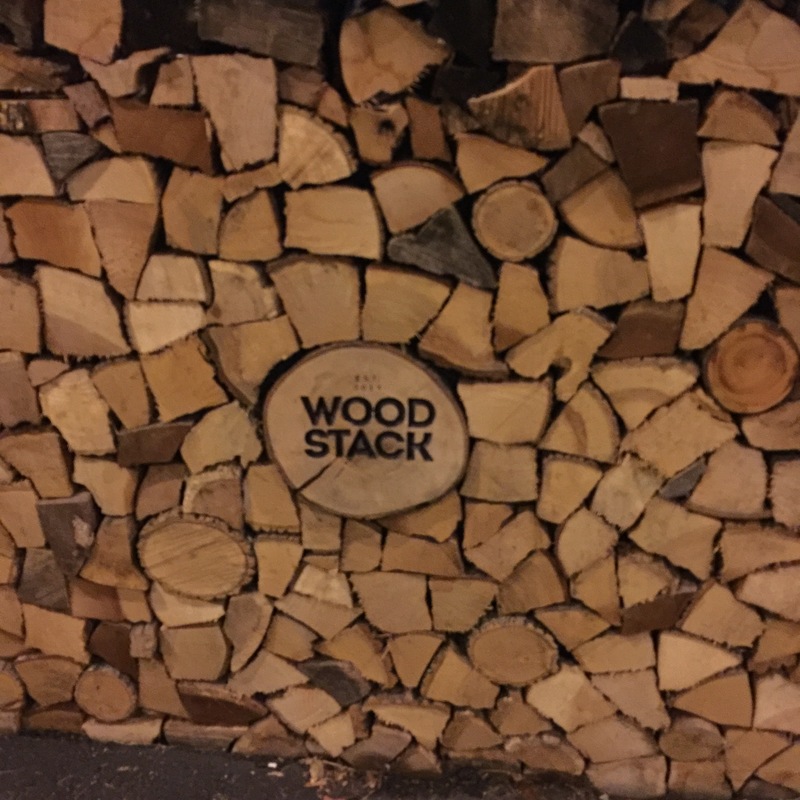 Today it is a wood-fired pizza place with a great menu of many eclectic Italian dishes. 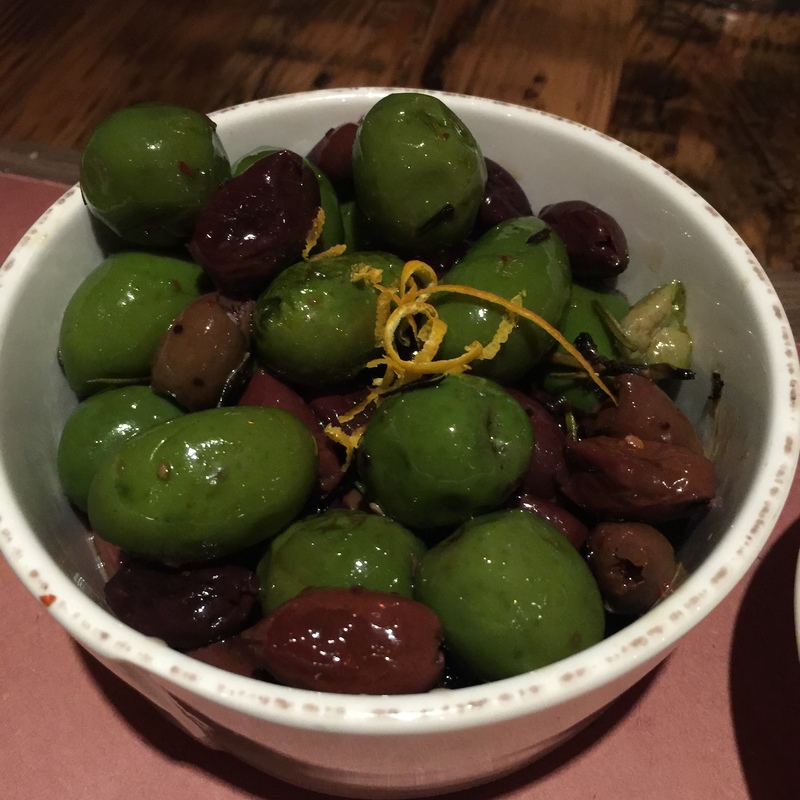 If you love olives, the wood fired olives with orange zest is great for everyone at the table. Its a huge bowl of assorted olives that are absolutely delicious. They also bring a quarter loaf of what tastes like sourdough bread, and its almost impossible to refrain from eating it all though you know so many other delicious items are coming. What was particularly interesting was their cocktail menu. So, this is where I start, with the cocktails. Sugar & Spice caught my attention. Since I never really drink vodka, its really good to see it paired up with my favorites like Aperol, Lillet Blanc, cranberry juice, ginger liqueur, spiced syrup and orange bitters. I am a big fan of using bitters in any cocktail. Its no wonder that my fiancee snatched this up from me. She is not a drinker and does not even like the taste of alcohol, so if she decided to make it her own, you know it had to be good. For me it was tasty but a bit weak, which is perfect for someone who wants a lighter cocktail. So, to replace it, I ordered a NYFAP. Not sure what that stands for, but its a bourbon drink with ginger liqueur, iced tea, sugar and charred lemon. The charred lemon was the star here, otherwise I was not all impressed. It definitely had t he bourbon in there, but I did not really taste the ginger, and naturally ice tea would barely add any flavor. I have to admit, a great cocktail is largely dependent not only on the ingredients but the presentation as well. A really great garnish never hurts either. Sure, it takes an extra 15 seconds, but presentation when you are paying $12 per drink is important. The Raspberry Jive is a sweet and savory cocktail. Gin, strawberry, agave, lemon, orange, mint and a speared strawberry with fresh basil leaf added to the presentation. Unfortunately, the price point is almost a deal breaker. 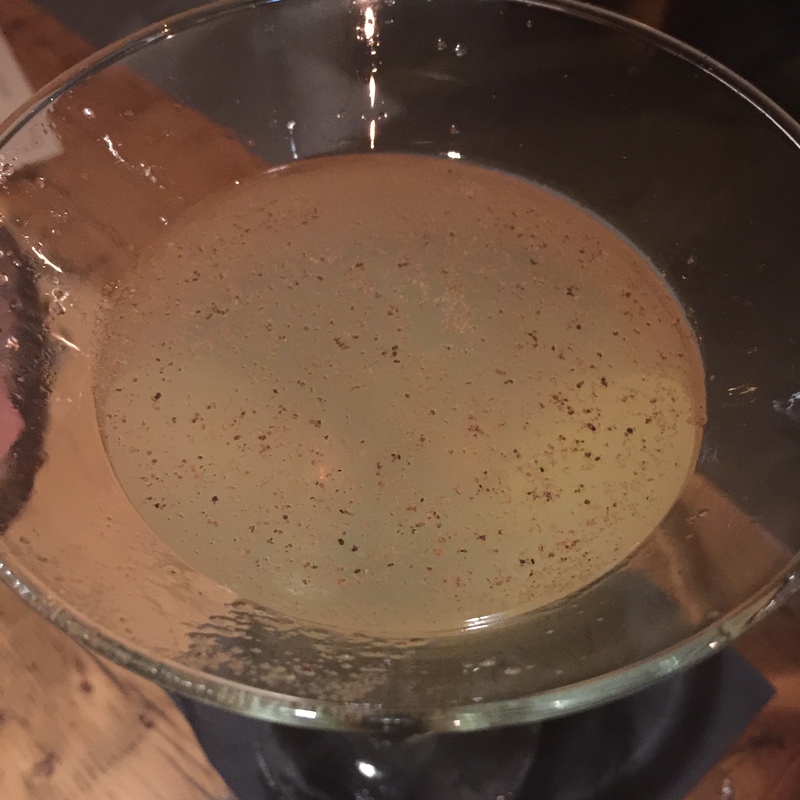 I had the good fortune to dine at some of the very best cocktail places in nearby Manhattan, and regardless of the quality of ingredients and expert level of mixology, there is absolutely no justification for charging the same prices you would find in some of the best cocktail lounges in New York. 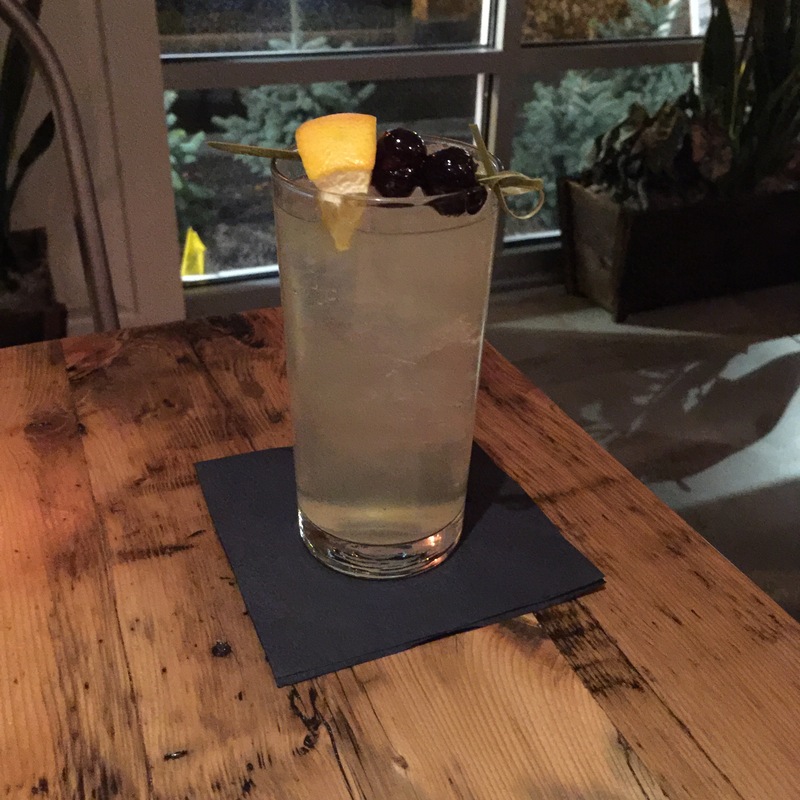 Their version of the classic French 75 served as a highball was quite good. 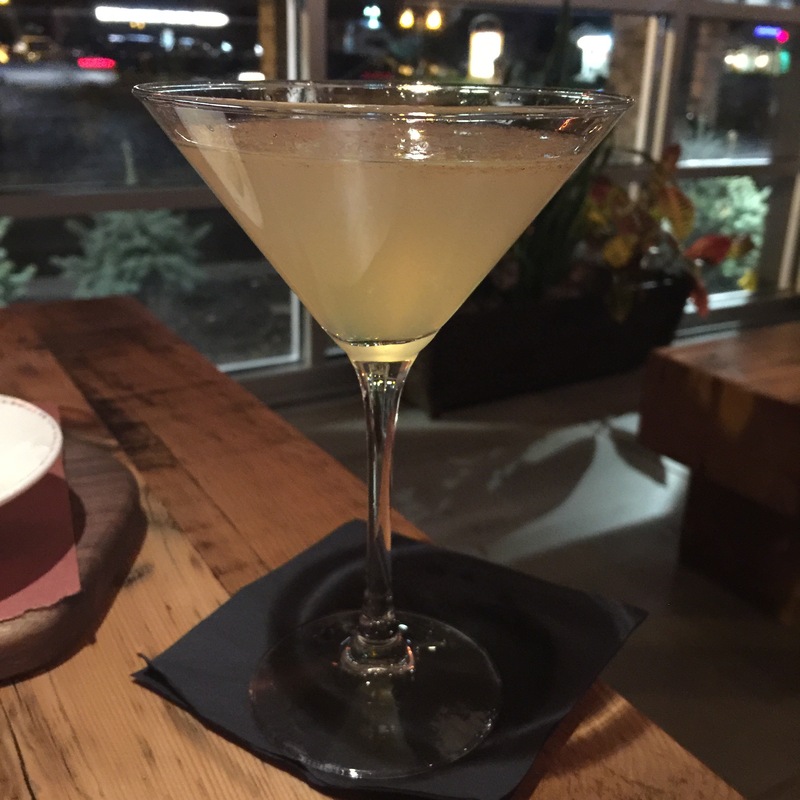 I never really liked the cocktail until I had theirs. They have great cocktails. They have very unique cocktails I’ve never seen in other upscale lounges. Below is a cocktail they call the Ginger Snap with vodka, ginger liqueur, maple and lemon, its really fantastic. But is it worth the price of their wood-fired pizza or one of their appetizers? I don’t think so, but maybe you do. For me food takes far more effort to prepare and cook, and cook properly. A cocktail satisfies one. but a pizza 2-3 people at the same price. Just keep that in mind. So, we move on to the food, which is why I came to begin with. 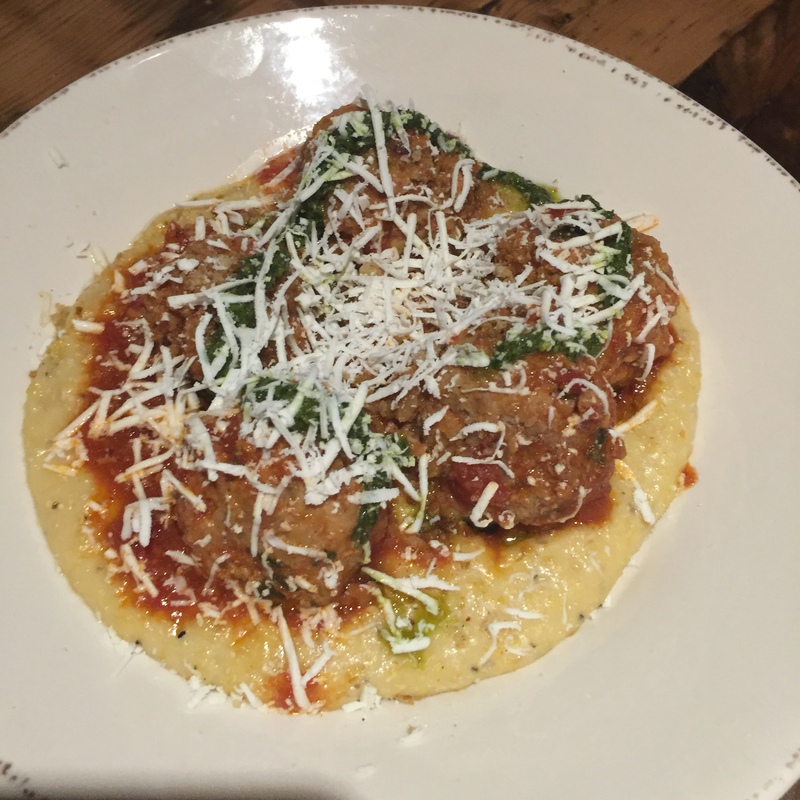 Meatballs served on a generous bed of polenta was really good. The sauce was great, the polenta was the best I’ve had, but the meatballs themselves were not. They were not bad, but growing up Sicilian on homemade meatballs every Sunday, I have opinions. If I had the option, the next time I return, I would just skip the meatballs and ask for the sauce over polenta. My friend orders the Buttery Bibb salad… baby bib with walnuts, gorgonzola, apples and its quite tasty. You have to have some salad with your m eal. ies, the meat and cheese were nothing spectacular. They were good, but not the best. Its just a good starter, and something on this plate should please everyone if you order it as a communal appetizer. So now its on to the main event. The pizza. It is important to note that there is pizza that is heavy on the cheese, thick in crust with a bite. 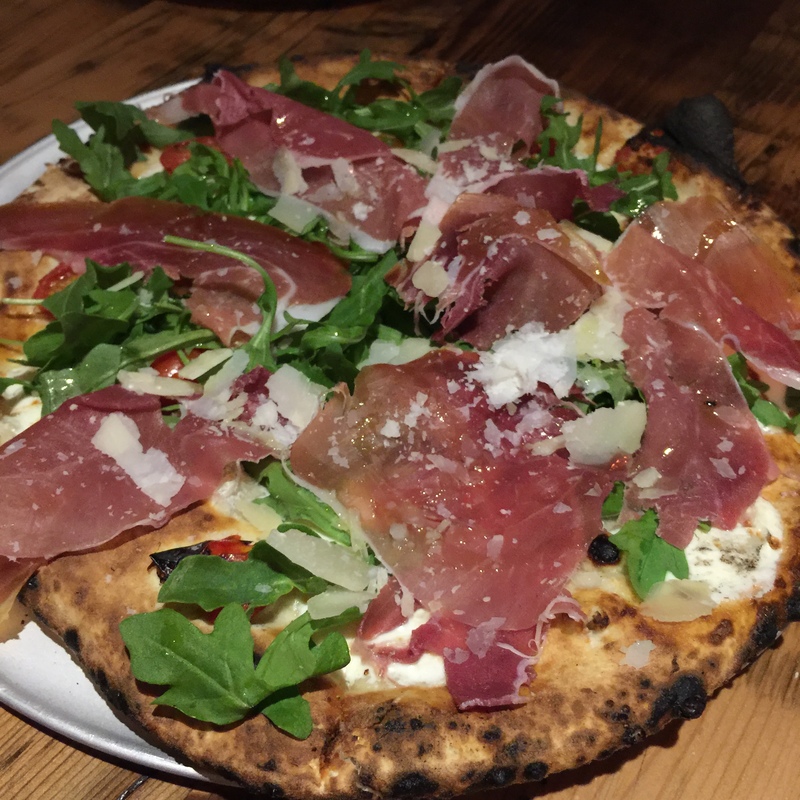 Then there is the Neapolitan pizza which many prefer, especially anyone from Italy. It is a softer, fluffy crust, and very vulnerable to heat. In this case, you get a delicious inconsistency where there are some charred sections which many welcome, and other parts which are perfect. These pizzas literally cook in seconds, approximately 180 seconds, as opposed to 10-15 minutes (that is under 3 minutes for you who are mathematically challenged like myself. Of course, the most basic is the classic Margherita pizza. Its a simple balance of tomato sauce, fresh mozzarella cheese and fresh basil and is said to be symbolic of the Italian flag (red, white and green) and was in honor of Queen Margherita of Italy in 1889, who was basically a fascist, but at least we got a great pizza in her name. We also got the Jersey Garden which is carmelized eggplant, Fior Di Latte mozzarella, basil, tomato sauce, and ricotta salata. And for good measure one extra, the Tartufo which is mozzarella, fontina, roasted mushrooms, truffle oil, thyme. All of these are considered “personal size” pizzas, but the truth is each one could feed two if you get appetizers, we just happen to order 3 for the 4 of us and rather than waste the 2 extra slices, of course I ate them for the sake of not throwing food out. On my next visit my brother wanted the Braised Short Ribs. The two sides definitely overshadowed the ribs. The Fall succotash of butternut squash fondue, almonds and chive risotto were absolutely delicious. The short ribs themselves, well, maybe I am wrong, but I always thought that braised short ribs would have cooked for hours until they were falling apart. These were good, but perfect on the outside but from the photo you see, red on the inside. They were cooked, but I always thought that this cut of meat was best when it cooked and served after several hours of slow cooking. They have great desserts as well, this was my favorite, something to satisfy every sweet tooth. The atmosphere here is interesting to say the least. Its arranged like an outdoor picnic area with long wooden tables. They are running silent Charlie Chaplin films on the wall, but there is 1980s music playing. I hate 80s music, but they did manage to blend in a lot of the good stuff usually omitted from the top 40 I detest so much. There is not just the pop but also soft and hard rock hits mixed in which is a nice change from what most places play. The kitchen is also in clear view.